A neutron walks into a bar and orders a drink. He asks the bartender, "How much?" "For you, sir, no charge." Shakespeare walks into a bar and asks the bartender for a beer. ""I can't serve you," says the bartender. "You're Bard!" 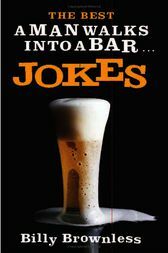 Everyone has their own favorite man-walks-into-a-bar joke. This is a collection of more than 200 of the best—or should that be worst? It includes the old favorites, the most stupid, the funniest, the brainbenders, the politically incorrect, the great puns, and the really, really bad puns. Billy Brownless is a former Australian football player who now stars in The Sunday Footy Show.